It's a fact: Airbnb wants more hosts in Toronto. There are certain cities around the world (Paris for example) that have an over-supply of Airbnb hosts. And then there are cities like Toronto, that have a shortage of hosts. But there are still a *lot* of people looking for a place to stay in Toronto. What this means for someone in Toronto willing to become an Airbnb host is that you can easily help pay for your next vacation (or your mortgage) by renting out an extra room in your apartment or house, particularly in the high demand seasons of spring & summer, or around holiday dates. On top of that, Airbnb is currently offering a $250 cash bonus incentive to anyone in Toronto who becomes an Airbnb host for the first time. How much can I earn by being an Airbnb host? When I contacted Airbnb to ask about potential earnings as a host in the Toronto area, they told me "Toronto hosts can earn up to $680CAD per week during the summer travel season", and that this was based on "the average weekly earnings from the top 10% of hosts during the 2015 summer travel season". The Airbnb website/app has a handy feature that shows you the average price of what places are going for in different markets. Using this feature, I came up with the following estimates for what an Airbnb host could earn (on average) in the summer of 2016 in the Toronto market. IMPORTANT: You *must* start by going to the above link, in order for Airbnb to track your listing correctly for this offer. 2. Scroll down a bit and click on the pink 'List Your Space' button. IMPORTANT: You *must* click on the pink 'List Your Space' button, in order for Airbnb to track your listing correctly for this offer. You will need to login to your Airbnb account if you haven't done so already. Or create an Airbnb account first if you don't have one yet. 3. Create a listing for your apartment, house, etc. 4. 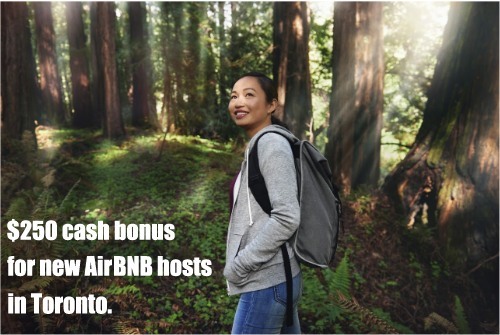 Receive a $250 cash bonus from Airbnb after completing your first booking as a new host in Toronto. - You must be a first time Airbnb host. - Your listing must be in the Toronto area (defined as a 40km radius from the intersection of University Ave and Dundas St W) and not a previously active listing in the Airbnb system. - Your listing must complete at least 1 booking between June 1 and August 31, 2016, with a minimum booking value of $50 CAD (excluding fees). - Your listing must be created by going through the Airbnb $250 cash bonus offer link. - Meet fellow travelers and make new friends from around the world. - Use the income from hosting to pay for your next vacation, your mortgage, or a creative passion. - Host whenever you want, and as much as you want. You have 100% flexibility on the dates you feel like hosting, whether it's while you're home, or on vacation yourself. - Host Guarantee: In the rare case of damage, eligible property is covered up to $1,000,000 by Airbnb. Click on the pink 'List Your Space' button. You will need to login to your Airbnb account if you have not done so already. If you don't have an Airbnb account, you will need to create an Airbnb account first. toronto, yyz, articles, airbnb and airbnb hosting. 12 Responses to "Pay for your next vacation by becoming an Airbnb host - $250 cash bonus for first time hosts in Toronto"
Hey - I used the link and confirmed a booking but there was no notification for the offer. Does the offer apply after the payment goes through? "Your payment is automatically sent 24 hours after your guest checks in." I'm guessing Airbnb needs to send the $250 bonus after the guest has checked in, rather than before, in case there is a cancellation. I would recommend e-mailing that address over contacting the general Airbnb support team. Being a large company, most of their support team likely isn't aware of this promotion being held exclusively in the Toronto market. Hi! I followed your instructions but did not recieve an email regarding the cash bonus. Only received emails regarding my account now being setup and my listing now being live. I have someone staying next week, do they let you know about the cash bonus ever or they just send it after the first booking? I followed all the steps above but the $250 isn't showing up in my 'payouts'. My guest has already checked in. How can I fix this? That address was setup by Airbnb exclusively to handle support for this offer. Has it been 24 hours since your guest checked in? According to the offer page: "Your payment is automatically sent 24 hours after your guest checks in." anyone got 250 cash via this offer? i have done everything still nothing.. I received mine a few days after my guest checked in. Did you already have your guest check in ? I follow YYZ and the amazing deals you post for us in Toronto, thank you for what you do for us fellow travelers. I was very motivated by the offer and potential benefits of hosting and went into much expense to renovate our basement and managed to finally put it up on Airbnb. I followed each step and even had my first guest last weekend. I waited for the bonus and on retracing my steps realized I had followed each step but missed one. I missed using the link from your website! I have called Airbnb to explain my error and they have redirected me to you. They have looked at my case in detail and understand what happened and aske me to connect with you. I am really hoping you are able to help me get my bonus: I really have gone through much to get started with Airbnb having seen this on your website. You may want to try e-mailing [email protected] and explaining what happened. This is a support e-mail address set up by Airbnb specifically for this offer and will reach someone that should be able to help.